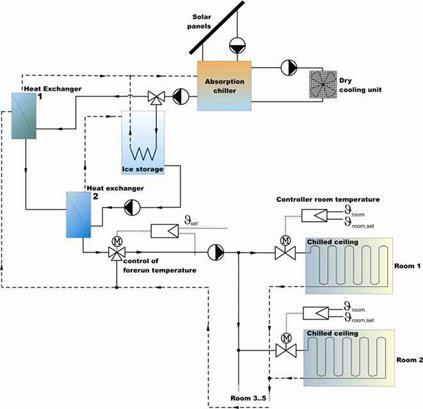 This work presents publishable information of the European-Craft project “OPICS — Optimised Integrated Collector Storage: Low-Cost Solar Thermal Systems for Houses and Offices” that finished on 2005. The project was funded in part by the European Commission and involved the companies DISOL and FOELCA from Spain, CIVILMAC from Portugal, SUNSTRIP from Sweden and UPC University. More than 7000 different configurations of integrated collector storage systems (ICSs) were simulated investigating different parameters such as the absorbing surface, single glazing, transparently insulated covers or water and phase change material store. Pre-industrial OPICS prototypes were constructed and tested following ISO procedures to assess the credibility of the results. Researched carried out proved that improved efficiencies can be achieved in the OPICS prototypes with respect to standard ICSs, and that they can be used in applications where standard ICSs are not able to give a reasonable performance such as space heating in moderate climates. The integrated collector storage (ICS) is a solar thermal system in which the functions of collection and storage of solar energy are performed within the same device. The integration of collector and storage elements leads to compact equipment simplifying the connection pipes and avoiding the use of intermediate elements such as pumps. Therefore, ICS is one of the simplest and cheapest solar thermal systems. In fact, the first thermal solar systems constructed were ICSs and during all the XXth century this kind of systems were installed all over the world. As in the ICS the thermal storage is directly exposed to the ambient, the system heat losses are high. This problem, together with other problems always inherent in solar thermal systems as freezing of the thermal fluid or overheating, have limited up to now the applicability of the ICS to domestic hot water applications of familiar houses in warm climates. Technologies as transparent insulation materials (TIM) and phase change materials (PCM) make it possible to improve the performance of the ICS maintaining low costs. Transparent insulation materials allow reducing the thermal loss through the cover while preserving good optical performance, and phase change materials can increase the energy storage in the collector avoiding overheating and freezing problems. cavities, heat storage, etc… This difficulty is even increased when new technologies such as TIM or PCM are used. One the other hand, one of the major drawbacks to be solved in solar thermal is the integration of the equipment in buildings. Most solar thermal systems and elements do not take into account the shape and the design of the buildings in which they will be installed, and generally the occupied space is not optimised and the visual impact is very criticised specially from architectonical points of view. An European-Craft project called “OPICS-Optimised Integrated Collector Storage: Low-Cost Solar Thermal Systems for Houses and Offices” was carried out from 2002 to 2005. The project was funded in part by the European Commission and involved 4 European Companies (DISOL and FOELCA from Spain, CIVILMAC from Portugal and SUNTRIP from Swdend) and the UPC University, see . • Use of Transparent Insulation Materials (TIM) and Phase Change Materials (PCM). • Improvement of the efficiency with respect to available ICSs. • Modular design to facilitate integration and to reduce installation costs. Major developments of the project are two pre-industrial prototypes called OPICS1 and OPICS2. They both use a TIM-cover and have a modular rectangular shape that facilitates their integration in buildings. Main difference is the store. In the OPICS1, energy is stored in a 75 l rectangular water tank with internal mechanical elements to prevent deformation with pressure. On the other hand, in OPICS2 energy is stored in a rectangular PCM store with an internal compact heat exchanger that permits to remove the accumulated energy. The prototypes were designed using virtual prototyping tools [2,3] and were measured following standard procedures [4,5]. This work gives an overlook of the OPICS projected including the strategy, methodology, a description of the major developments and an assessment of the results achieved. A seasonal chemical heat store, based on the hydration/dehydration cycle of a magnesium sulphate composite material, has been developed. During the summer, the material stores heat by an endothermic dehydration reaction and heat used for space heating is released in winter by rehydrating the material. The first elements for the sizing of the heat storage material tank have been calculated by modelling a conventional solar combisystem. For a low energy house of 191 m2 located in Paris, with a heat demand of 37.2 kWh. m-2 for space heating (53.0 kWh. m-2 including domestic hot water), the volume of magnesium sulphate required to reach a solar fraction ranging from 50 to 57 % varies from 0.2 to 0.9 m3. For the same house located in Marseille, with a space heating demand of 15.4 kWh. m-2 (31.1 kWh. m-2 including domestic hot water), a 100% solar fraction is achievable with a volume of 0.7 m3 of magnesium sulphate. The hydration-dehydration reaction occurs at a gas-solid interface. In order to optimise the rate of reaction and the thermal power released or absorbed, the active material needs to be dispersed, which increases the volume of storage to an estimated 2 m3 to reach 50 % of the theoretical energy density of the dense salt. Composite materials made of magnesium sulphate are being developed at EDF R&D with the aim of reaching an energy density of 150-400 kWh. m-3 at a storage temperature compatible with solar thermal panels. 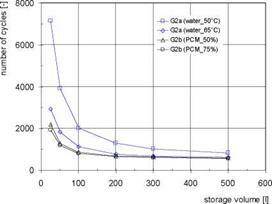 The hydration of MgSO4/zeolite composites in an open system leads to higher temperature lifts and usable heat than MgSO4/silica gel composites. Keywords: thermal energy storage, thermochemical storage, magnesium sulphate. Most of the final energy consumed in France is used in the form of heat (85 Mtoe over a total of 161 Mtoe in 2004). Heat is also the largest part of the final energy used in buildings (around 46% of the total energy) and is responsible for 25% of the greenhouse gas emissions. It has therefore a considerable potential for energy savings and is a key element in the reduction by a factor of four of the GHG emissions by 2050 in Europe . Coupled with actions to reduce existing dwellings heat demand through thermal insulation and better energy management, the use of high efficiency systems and renewable energy sources is necessary to fulfil this goal. The available solar energy is huge, but the main difficulties lie in the diurnal and seasonal variations of the resource. Solar heat is available in excess in summer months, whereas a deficit occurs during the winter months (Fig. 1). • thermochemical heat storage, based on a sorption or a chemical reaction, with thermal energy densities between 150-1500 kWh. m-3. The storage of heat using a chemical reaction is the most suited to seasonal heat storage because of the lack of thermal losses. Moreover, its volumetric energy density can be much greater than other forms of storage. During the summer, the material stores heat by an endothermic dehydration reaction whereas heat is released by rehydration in winter and used for space heating. Composite materials are being developed at EDF R&D with the aim of achieving usable energy densities between 150-400 kWh. m-3 at a storage (dehydration) temperature compatible with solar thermal panels. Sizmann shows that the storage capacity is limited by it ability to take up entropy at a given temperature change . This is also valid, if, in addition to the storage of sensible heat, the latent heat of a phase change can be utilized. The storage capacity can be increased significantly by the additional entropy change of the phase change . In order to avoid the limitation by the achievable entropy uptake for “direct” TES systems (like sensible and latent), the entropy coupled to the heat supplied to the storage has to be separated. Such an “indirect” TES system is only storing work. It is now able to do this without any thermodynamic limitations. However indirect TES are for discharging not independent as direct TES, where energy and entropy are available at the right relation. At discharging heat from the ambience has to be available to provide entropy for the heat release of the storage. This necessary connection to the ambience can be seen in figure 4 and 5. Advantages of such systems compared to direct TES are a higher flexibility concerning charging and discharging temperature and a higher storage capacity. An important design specification for a TCM system is the required thermal power input, which is related to the amount of material in the reactor and how fast the solar heat can be fed to the material. Typically, this process is complicated by the low thermal bed conductivity of the TCM powder, which is due to the low conductivity of the gas in the pores between the particles. Also the water vapour transport out of the layer of TCM powder is critical, and insufficient vapour transport out of the material may result in unwanted melting. One can try to improve the heat and vapour transfer simultaneously by stirring, thereby speeding up the conversion. Three design cases have been evaluated for dehydration reactor volume in the following paragraphs, under the assumptions that the reactor power required is 3 kW (see Fig 4) and that heat transport is the limiting factor. 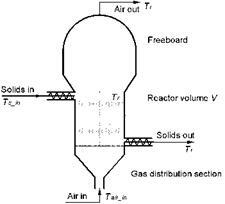 A fluidised bed reactor (see Fig. 5a) creates very good mixing of the powder, thereby improving strongly the vapour transport and the heat transfer. Fig. 5b shows that for small particles, the fluidisation velocity is small, limiting the power required for the fluidisation, while the heat transfer to the embedded heat exchanger is strongly increased. However, the fluidisation may cause breakup of TCM particles that are fragile already due to the cracks caused by repetitive hydration and dehydration. The resulting fine dust may be blown out of the fluidised bed reactor, thereby reducing the amount of active material. Also, this very fine powder cannot be fluidised properly. For the case of dehydration of the TCM in a 3 kW reactor, assuming 200 micron particles and an effective heat transfer of about 350 W/m2K to the immersed plate heat exchanger (consisting of 11 parallel plates of 7.5 cm x 19 cm each), this would lead to a reactor fluidisation section (excluding the freeboard and the gas distribution section) of about 20 cm in length and 11 cm diameter, in which about 40% of the open volume would be filled with TCM, while about 30% of the reactor volume is taken up by the heat exchanger volume. Due to the low fluidisation velocity (resulting from the small particle size), the power required for fluidisation is in the order of a few Watt. This seems promisingly low, provided that the pressure drop in the porous support and other parts of the reactor can also be kept small. If the Aquaculture plant is build near marine salt works the DSP could be a good alternative to a conventional Solar Pond. We are going to considered two typical side-by-side salt works with 1000 m2 surface and 2m depth represented by L1 and L2 (Figure 5). The first basin is constructed in order to act as a Solar Pond (Figure 5:1) and will work in a regime adjusted to aquaculture operation with an energy extraction of 30 kW. The only operation to be done is to create the gradient in L1 (Figure 5:2). This is usually done with a diffuser that fills the pond from 1.5 m to 2 m depth. Here a salinity gradient is created being upper zone with 3% (seawater salinity) and the bottom with 25% of salt concentration. This operation takes about one week. At this time L2 basin is in a stand by mode. If we only consider losses by salt diffusion L1 can work for a long time (about nine years) (Figure 5:3). After this the NCZ of L1 will be homogenized (Figure 5:4). Nevertheless there are other kinds of instabilities that accelerate this process. On the other hand we need to alternate the operation of L1 and L2 ponds with a periodicity of one year. When L2 begins to be constructed as a Solar Pond (Figure 5:2a) L1 can aid to raise the initial temperature by energy extraction transfer. After about one week L2 is in conditions to work (Figure 5:2b). In this way L1 and L2 are connected. Fig. 5 — Diagram with the two Solar Ponds, DSP concept, L1 and L2. If L1 is not completed homogenized (Figure 5:4) the process must be accelerated. There are several processes to do this. Nevertheless, the simpler one is to stop the heat extraction. This will quickly raise the temperatures at the SZ and will destabilize the pond (Figure 6). After this stage is reached, one must regain the initial concentration of 25% at the bottom. The remaining water must be evaporated from the pond until this concentration is reached. Basic calculations give the rate of evaporation to reach the original salt concentration of 25%. Results points that we need 51 days for a pond temperature of 40 °С, 29 days for 50 °С, and only 10 days for 80°C. Fig. 6- 1000 m2 DSP without heat extraction. We may conclude that for Aquaculture facilities these kind of solar ponds, are well designed and considerable less expensive than conventional ones. We must emphasize that this concept needs an annual periodicity of construction that is the periodicity of marine salt works recovering. In this way we have always a Pond that is working. The key of the concept of Dual Pond is to standardized maintenance operations with an annual periodicity. The results here presented are a first approximation and more work must be done to deal the concept with assurance. Nevertheless in a first insight it seems to work giving the thermal energy needed for the application in mind. — F. Zangrando /’Technical Note-Simple method for establish salt gradient solar ponds", Solar Energy, 24, pp:467-470, 1980. The experiments are carried out in a box with a square base of 100×100 mm and a height of 150mm. The base of the test cell is made of copper with 5 mm thickness and the lateral sidewalls are made in 4 mm transparent acrylic. The sidewalls are isolated by 30 mm polystyrene coated with 5 mm ceramic fiber. This isolation is removed temporarily each time flow visualization with PIV and Shadowgraph techniques occurs. A precision heater is used to provide uniform heating over the base of the copper test cell at a prescribed temperature. 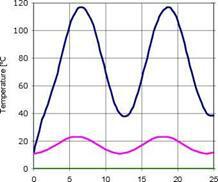 The desired linear salinity gradients are created using the two tanks method described by Oster  and Hill . By applying the PIV system the measurement of velocities in the convective regions and the observation of the flow patterns are accomplished. Figure 1 shows the PIV setup. A 10Hz Nd:YAG Q-switched laser with frequency doubled 532 nm wavelength emits a circular light beam, and an optical setup (beam shaping optics) creates a sheet of light with 1 mm thickness and low divergence height. This sheet of light crosses the inspected volume and the light scattered by the seeding particles is visualized by a CCD camera, perpendicular to the light sheet. The seeding particles, hollow glass spheres with an average diameter of 12 pm, are mixed in the aqueous salt (NaCl) solutions before the formation of the stratified layer. The synchronization between the laser and the camera is made by an electronic circuit developed for that purpose. For each PIV acquisition 30 images of particles, exposed to individual frame and with an acquisition rate of 10Hz, are captured. Afterwards, these images are processed using specific software (Dynamic. Studio from Dantec Dynamics A/S). The processing consists in the cross-correlation of each pair of images of particles captured, producing a vector map of the instantaneous velocity field of the field of view. At present study, the field of view of the PIV system is a rectangle with 64 mm height and 84 mm width. 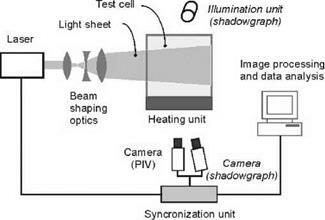 Figure 1 also includes the schematic of the Shadowgraph setup. This method makes use of a 100W halogen lamp that projects the emitted light on a semi-transparent screen placed near the test cell. This allows a near to 1:1 relation between the object and the projected shadowgraph image. Using this technique the positions of the interface zones can be identified, and their evolution analyzed. The shadowgraphs images that capture the sudden changes on the medium refractive index are visualized by a CCD camera, alternating with the PIV analysis. Both the CCD cameras have 640×480 pixels and 8.6×8.3 pm pixel pitch. The vertical temperature and concentration of salt distributions near the centre of the test cell are measured during the experiments with a Micro Scale Conductivity and Temperature Instrument, MSCTI (from Precision Measurement Engineering, Inc) . From time to time, this probe, with high special resolution (1 mm) and fast response, is made to move slowly through the system, using a computer controlled linear translation axis to command the step movement of the MSCTI and the translation velocity. The measurements were performed with a 1 mm step and with a velocity translation of 0.1 mm/s, or 0.05 mm/s. Empirical equations are used to convert conductivity data, at a giving temperature measured simultaneously, to salt concentration . A vertical temperature probe rake, consisting of 16 calibrates Pt100 probes mounted at approximately 5 mm intervals, allowed the continuous measurement of the evolution of the vertical temperature profile during the experiments. The focus of this work was the identification of suitable PCMs in the temperature range 120 to 250°C. First, literature of organic PCMs in this temperature range was reviewed. In summary, it can be pointed out that the long-term thermal stability, the reactivity with air oxygen and the high vapour pressure of organic materials are the major critical aspects. All discussed organic PCMs require hermetically sealed storage systems and this can be considered disadvantageous. 250°C can be covered by these systems with a maximum temperature gap of 20°C (Fig. 5). Known values of the latent heat factors were in a range from 14 to 33 J/(mol K), where LiNO3 systems had exceptionally high values of 36 and 43 J/(mol K). In this work unknown minimum melting temperatures and systems around 170°C were assessed in more detail by phase diagram determinations and melting enthalpy measurements. Although KNO2 can be regarded as an less ideal candidate material, because it is a uncommon substance and strongly hygroscopic, it is the only material of the selected candidates, which forms binary systems with a melting temperature in the range 150 to 190°C. Of the two candidates at around 170°C, KNO2-Sr(NO3)2 has been identified as the favorable system due to its higher melting enthalpy and flatter liquidus line rather than KNO2-Ba(NO3)2. H. P. Garg et al. (1985) Solar Thermal Energy Storage, Reidel Publishing. R. Tamme et al., International Journal of Energy Research, 32 (2008) 264-271. G. J. Janz et al. (1978-1981) NSRDS-NBS 61 Part I, II and IV. B. Zalba et al., Applied Thermal Engineering, 23, (2003) 251-283. A. Hoshi, D. R. Mills, A. Bittar, T. S. Saitoh, Solar Energy 79 (2005) 332-339. 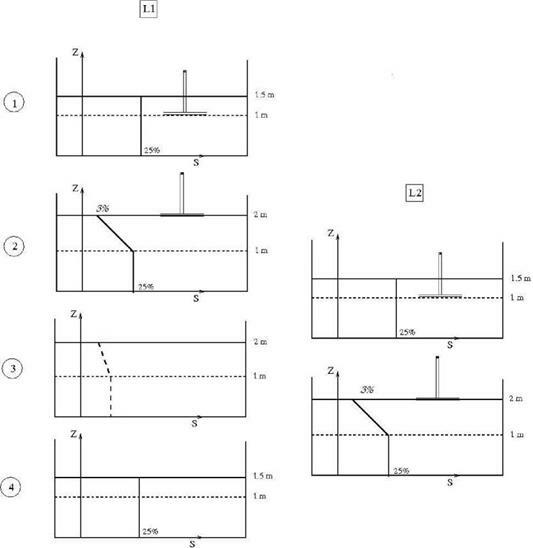 C. E. Birchenall, et al., Metallurgical and Materials Transactions A, 11 (1980) 1415-1420. H. Kakiuchi (1998) IEA Annex 10, 2nd Workshop, Sofia, Bulgaria (1998). D. Chandra et al., Z. Phys. Chem., 216 (2002) 1433-1444. S. D. Sharma et al., International Journal of Green Energy, 2 (2005) 1-56. T. Ozawa et al., Thermochimica Acta, 92 (1985) 27-38. Ullmann’s Encyclopedia of Industrial Chemistry (1998), 6. Edition, Wiley. J. Font et al., Journal of material chemistry, 5 (1995) 1137-1140. R. Sakamoto et al., Thermochimica Acta, 71 (1984) 241-249. I. O. Salyer et al., Journal of Applied Polymer Science, 28 (1983) 2903 — 2924. T. Clauhen et al., Symp. 8. Internationales Sonnenforum ’92 (in German)(1992), 1259-1264. H. Inhaba et al. Transactions of the Japan Society of Mechanical Engineers. B, 63 (1997) 3382-3389. Y. Takahashi et al., Thermochimica Acta, 50 (1981) 31-39. T. Ozawa et al. (2003) Chp. 7: Energy storage, in Handbook of Thermal Analysis and Calorimetry, 2. P. A.E. Vallejo et al., Proc. of the COMSOL Multiphysics User’s Conference, Boston (2005). G. Hakvoort et al., Journal of Thermal Analysi and Calorimetry, 69 (2002) 333-338. D. G. Lovering (1982) Molten salt technology, Plenum Press. A. Verma et al., Canadian Journal of Chemical Engineering, 56 (1978) 396-398. R. P. Tye et al., Proc. 7th Symposium on Thermophysical Properties, ASME, (1977) 189-197. Y. Takahashi et al., Thermochimica Acta, 123 (1988) 233-245. Y. Abe et al., Proc. 23rd. Intersoc. Energy Conv. Eng. Conf., Denver, 2, (1988) 159-164. R. J. Calkins et al., Report SAND-81-8184, Sandia Lab. (1981). Y. Takahashi et al., Thermochimica Acta, 121 (1987) 193-202. Y. Takahashi et al., International Journal of Thermophysics, 9 (1988) 1081-1090. I. Barin (1995) Thermochemical Data of Pure Substances, 3. Edition, VCH. K. H. Stern, J. Phys. Chem. Ref. Data, 1 (1972) 747-772. R. P. Shisholina et al., Russian Journal of Inorganic Chemistry, 8 (1963) 1436-1438. E. Thilo et al., Proc. 7th. Conf. on the Silicate Industry, Hungary (1963) 79-85. M. V. Tokareva et al., Zhurnal Neorganicheskoi Khimii, 1 (1956) 2570-2576. E. Schumann et al., Berichte der Bunsen-Gesellschaft (in German), 74 (1970) 462-470. E. M. Levin et al. (1956) Phase Diagrams for Ceramists, The American Ceramic Society. J. Alexander et al., Industrial & Engineering Chemistry, 39 (1947) 1044-1049. X. Zhang et al., Thermochimica Acta, 385, (2002) 81-84. R. W. Berg et al., Dalton Transactions (2004) 2224-2229. R. N. Grugel et al., J. Material Science Letters 13 (1994) 1419-1421. P. I. Protsenko et al., Russian Journal of Inorganic Chemistry, 6 (1961) 850-854. P. I. Protsenko et al., Russian Journal of Inorganic Chemistry, 20 ( 1975) 924-927. 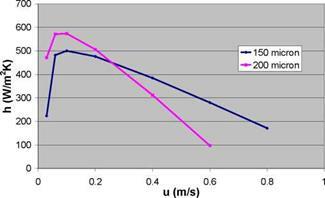 Four simulation studies were performed in Subtask C. Three of them were using more or less the reference conditions defined in Subtask A . One of them dealt with a complete different application to reduce boiler cycling by introducing a PCM store. reminded that the proposed system has been analysed only from the simulation side, where a water tank storage filled only with water or filled with water + PCM (paraffin RT35) is compared. To evaluate the impact of the PCM on the performances, it is possible to define the energy gain between the Fsav, therm for the tank with PCM (Fsav, therm(W+PCM)) and only with water (Fsav, therm(W)). If this gain is higher than 0, then the PCM brings an advantage. As it can be seen in Figure 3, the gain due to using PCM is low. A decrease of the RATIO according to the increase of the Fsav, therm can also be noticed. But it should be remembered, that when the Fsav, therm is high, the solar installation is oversized. As it can be seen, adding a PCM becomes less interesting when the solar system is oversized. This is due to the fact, that when oversized, the storage of heating is less relevant. The fractional thermal energy savings fsav, therm are a measure of the percentage of the auxiliary (non-solar) energy input for heating that can be reduced by the solar system. This term does not account for electricity use unless it is used directly for heating. The efficiency of electricity production and distribution pel is 0.4 in all cases. Hereby Qboiler and Qelheater are the energy inputs of the solar combisystem with respective efficiencies pboiler and pel. Qboiler, ref defines the energy input of a boiler of a defined conventional heating system with an efficiency of nboiler, ref . According to the additional cost of adding the PCM and the environmental impacts results described in , this system with PCM does not show a substantial benefit compare to a storage tank filled only with water. solar fraction can be achieved also with water stores of 5 — 10 m3. Taking into account the long term heat losses of water stores the size reduction is far bigger. At the Institute of Thermal Engineering (IWT), Graz University of Technology, Austria different hydraulic systems were investigated in terms of their ability to reduce boiler cycling operation . In the following a description of the hydraulic systems, which are used in the simulations, is given. Table 2 shows a summary of all simulated concepts. 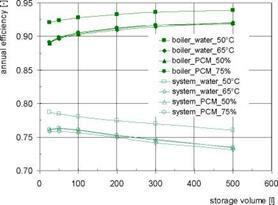 The results for the system with water storage (G2a) and for systems with water storage with integrated PCM modules (G2b) are shown in Fig. 4 for different storage volumes. In comparison to the systems without buffer storage the number of start-stop cycles is reduced strongly. Even with the smallest volume of only 25 litres of water a reduction of about 70 % (set temp. 50°C) or 90 % (set temp. 65°C) can be achieved. With increasing storage volumes the number of cycles decreases, whereby the potential for a further reduction is low for volumes above 200 litres. Because of the lower utilized temperature difference the number of cycles is higher with a boiler temperature of 50°C in comparison to 65°C. On the other hand the higher temperatures decrease the annual efficiencies of the condensing boiler by 2-3 %. The integration of PCM modules (boiler set temp. 65°C in all cases) allows an enhancement of the storage capacity, resulting in a further decrease of the number of start-stop cycles especially with small storage volumes. There are only minor differences between the PCM volume fractions of 50 and 75 %. The integration of PCM modules hardly influences the annual efficiencies of the boiler and the system (Fig. 4, right). Figure 5 shows the number of start-stop cycles and the annual efficiencies for the system G3a (water storage) and the system G3b (bulk PCM storage). Due to the higher storage capacity of the PCM storage (assuming the same volume of 45 litres) in system G3b the number of cycles can be reduced by 50 % compared to system G3a. The annual efficiency of the boiler is also slightly higher, which is a result of the lower amount of heat produced in start-stop operation due to the higher storage capacity. Phase change materials as heat storage theoretically offer an advantage compared to water stores, when the cycling temperature is close around the phase change temperature and the phase change can be used quite often. The other possible application is the use of the subcooling effect for seasonal storage. However, the investigations reported here showed only little advantages for macro-encapsulated PCM modules in combistores, PCM-stores with immersed heat exchangers and for PCM slurries for heat stores in solar combisystems and residential heating systems. The seasonal storage with subcooled PCM could be in principle a good solution. However the technical expenditure for this system is large. A. Abhat, (1983), Low temperature latent heat thermal energy storage: heat storage materials, Solar Energy 30 (1983) 313-332. Institute of Thermodynamics and Thermal Engineering (ITW) of the University of Stuttgart . A simulation program based on EES and Matlab was developed which predicts the experimental data well. Measurements have shown a higher volumetric capacity (56 kWh/m) than expected from published reports (40 — 44 kWh/m3) .The present design offers an efficient solution for cold storage at low cost, and low maintenance and operation efforts. The chosen type of storage is an ice-on-coil system with external melting. While internal melting would result in higher discharging rates, it is nevertheless not a viable option because of particular requirements on operational mode and design of the present heat exchanger. The ice store was implemented into the cooling system of the institute building and shows good in-service behaviour. Next steps are further development of the storage design, automation of the operational mode and detailed measurements and evaluation of in-service behaviour. system consisting of absorption chiller, ice storage and solar collector field. This system, which is illustrated in Figure 1, has been taken into operation in spring 2008. The latest extension of the solar production plant in Marstal means that they in 2008 have a solar fraction of 30% coming from 18.300 m2 of solar collectors combined with a 10.000 m pit heat storage and a 2.000 m3 steel tank. The rest of the fuel is biooil where the production price/MWh is app. 65 €. Marstal has therefore investigated the possibilities of a larger solar fraction. Design cal­culations shows that an extension with another 4.000 m2 solar collectors, a 10.000 m3 steel tank or pit heat storage, a 1,5 MW heat pump (to cool the storages and use outdoor air) will rise the heat production with 4.800 MWh/year and increase the solar/heatpump fraction to 45%. The production price for the extended production is calculated to 66 €/MWh with an annuity factor of 0,1 and without electricity tax. The extension is planned to be realised in 2009. Investment costs are 2,8 mio. €. Strandby Varmevsrk is a consumer owned district heating company producing 16.000 MWh/year with natural gas fuelled CHP and boiler. In the summer 2008 Strandby Varmevsrk is implement­ing 8.000 m2 solar collectors, 1.500 m3 steel tank and an absorption heat pump. The solar collectors will cover 18% of the annual heat production and the absorption heat pump will cover another 5%. The absorption heat pump is cooling fluegas from CHP, and boiler and utilising low temperature heat form the solar collectors. The production price for heat is calculated to 55 €/MWh (annuity 0,1).